NASA's ambitious OSIRIS-REX asteroid sample return mission swings by Earth this Friday for a gravity assist en route to asteroid 101955 Bennu. An old friend pays Earth a brief visit Friday, as the OSIRIS-REX asteroid sampling mission swings by Earth on September 22nd. Launched on September 8, 2016, OSIRIS-REX is bound for asteroid 101955 Bennu, due to arrive in the summer of 2018. 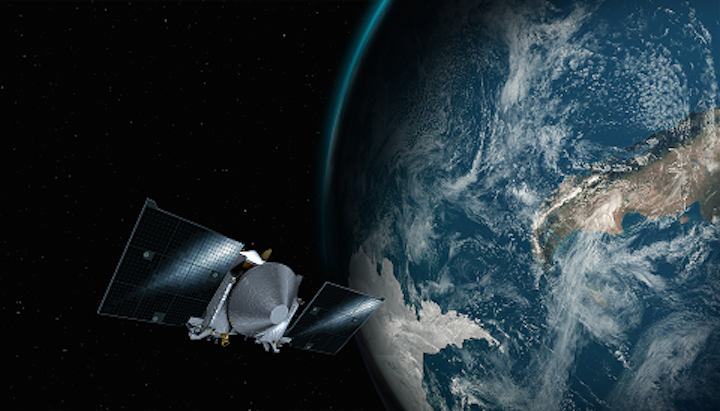 To boost its orbit beyond Earth's, OSIRIS-REX is swinging by our planet for a gravity assist. Closest approach occurs at 12:52 p.m. EDT / 16:52 UT at an altitude of 11,000 miles (17,000 kilometers) over Antarctica. That's about half the distance to geosynchronous orbit. 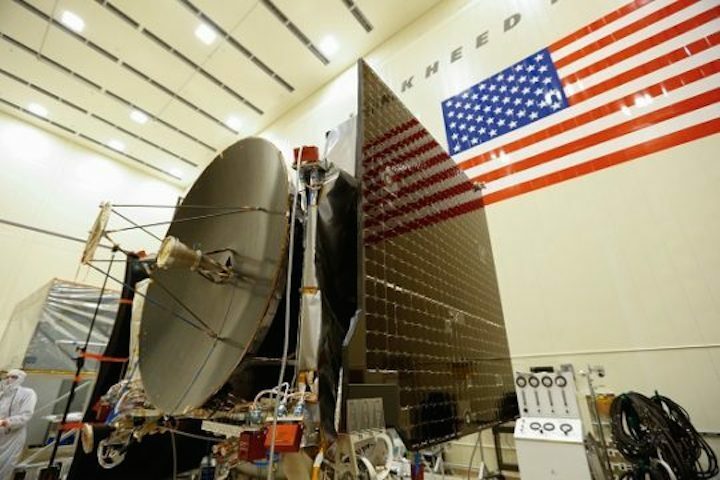 At just over 20 feet long (with solar panels deployed), OSIRIS-REX will stay below naked eye visibility. However, it should reach 10th magnitude as it crosses over eastern Australia (see the map below) — visible through a well-pointed, decent-sized telescope. The spacecraft will be moving at 8.5 kilometers per second (19,000 mph) at closest approach. 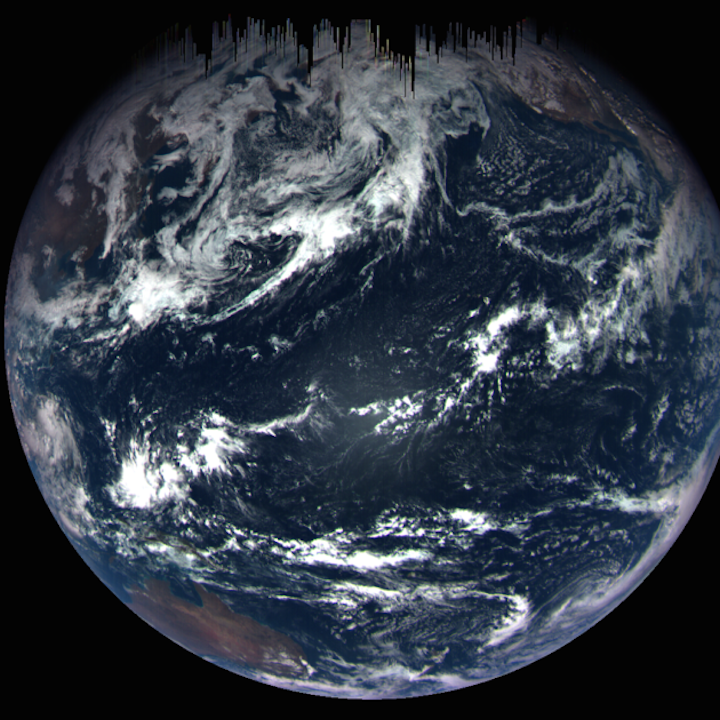 The OSIRIS-REX Visible and Infrared Spectrometer (OVIRS), Thermal and Emission Spectrometer (OTES) and Camera Suite (OCAMS) instruments will be active during the flyby and will image Earth and the Moon. We should see some interesting images on the Earth-Moon pair reminiscent of other spacecraft flybys in the past. The plan is for OSIRIS-REX to rendezvous with asteroid Bennu in August 2018, where it will carry out and execute the science and acquisition phase of its mission. Already, the team has been preparing for the approach to Bennu, using the spacecraft's MapCam imager to scout for possible Earth Trojans near the L4 and L5 Lagrange points. OSIRIS-REX hasn't located any Earth-Trojans yet, though it did spy asteroid 12 Victoria zipping across the MapCam imager's field of view on February 11th, proof that such a discovery is possible. Asteroid 12 Victoria, as captured by OSIRIS-REX. The mission will climax with the sample collection, as Osiris-REX will use the Touch and Go Sample Acquisition Mechanism (TAGSAM) arm to reach out and use a burst of nitrogen gas to blow small particles into the sampler collection chamber. The spacecraft will return to Earth on September 24, 2023, when its Sample Return Capsule reenters over the Utah Test and Training Range for recovery. 101955 Bennu is in a carbonaceous asteroid in a 1.2-year orbit around the Sun. It's about 275 meters in diameter, about the length of an Iowa-class battleship. The asteroid's orbit is inclined 6° relative to Earth's path around the Sun. Bennu was named after a bird from Egyptian mythology during the Planetary Society's “Name that Asteroid!” contest in 2012 . Discovered by the LINEAR project on September 11th, 1999, Bennu has a small (1 in 2,700) chance of impacting the Earth in the late 22nd century. This week's flyby will give the spacecraft the necessary kick to get it into the proper orbit — see the video below to watch how it works. The mission has company in the asteroid sample collection game: the Japanese Space Agency's Hayabusa 2 launched in December 2014. Hayabusa 2 will arrive at its destination asteroid 162173 Ryugu in July 2018, and the sample return will arrive back at Earth in December 2020. JAXA will also work with the mission team, the Japan Public Observatory and the Planetary Society of Japan to obtain images of the spacecraft from Japan, shortly after closest approach on Friday. The best views will come as the spacecraft passes over the eastern half of Australia in the early dawn hours on Friday, September 22, about an hour prior to closest Earth approach over Antarctica. 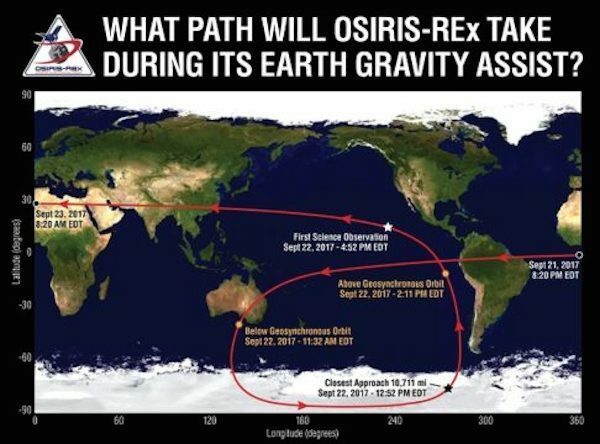 The Desert Fireball Network based out of Perth, Australia also plans to mobilize observers across the continent in an effort to catch OSIRIS-REX during the flyby maneuver. The flyby footprint for OSIRIS-REX Friday, September 22 with key event times. Chris Peat's Heavens-Above website has a link dedicated to the event, which will automatically generate minute-to-minute coordinates for your set location. 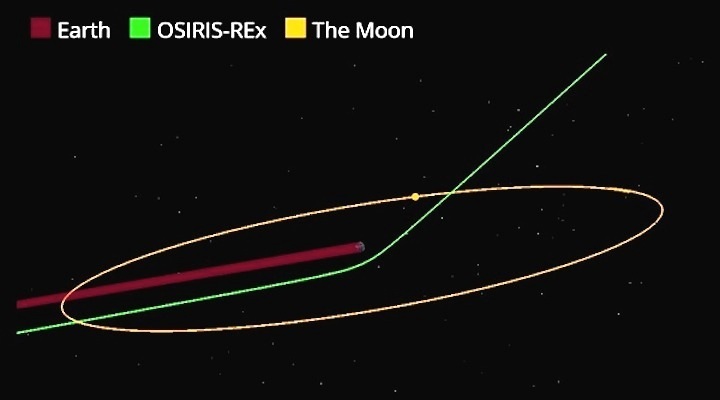 From Auckland, New Zealand, for example, OSIRIS-REX will be passing through the constellation Grus the Crane about an hour prior to closest approach, moving at an apparent 30' (the diameter of a full Moon) per minute. 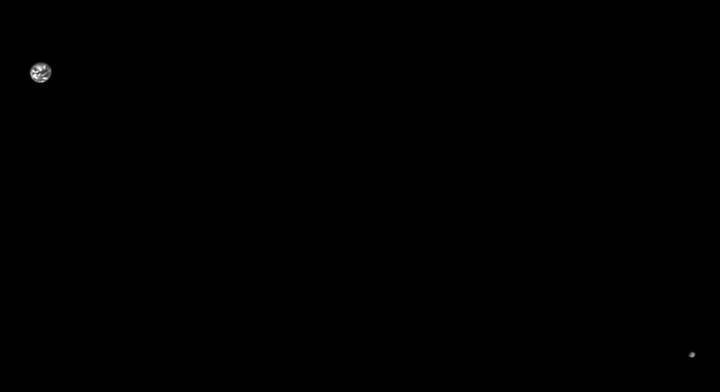 Friday's OSIRIS-REX flyby versus the orbit of the Moon. Another alternative is to use JPL Horizons Ephemeris Generator to calculate a range of right ascension and declination positions for OSIRIS-REX based on your observing location. As with very close passes of near Earth asteroids, parallax for ground based observers and deflection of the object by Earth's gravity both play a significant role, often foiling desktop planetarium programs that fail to take these into account. Hunting for OSIRIS-REX will be similar to tracking down satellites fainter than the naked eye limit. A good strategy is to simply note the time on a Heavens-Above star chart when the spacecraft is set to pass a bright star, aim a telescope at the star with a low power wide field of view, then sit and watch in an “ambush” as OSIRIS-REX drifts by. Bob King describes a similar quest this week: tracking down satellites in geosynchronous orbit. Clouded out, or simply live in the wrong hemisphere? NASA TV is carrying live media interviews during Friday's flyby, September 22 starting at 6:30 a.m. EDT. The OSIRIS-REX team is also encouraging the public to simply tweet photos of themselves waving to the spacecraft to hashtag #HelloOsirisREX (the mission is @OsirisREXon Twitter) or on Instagram as @Osiris_REX. Be sure to say hello — next time it visits Earth, it'll be with samples of an asteroid in hand. 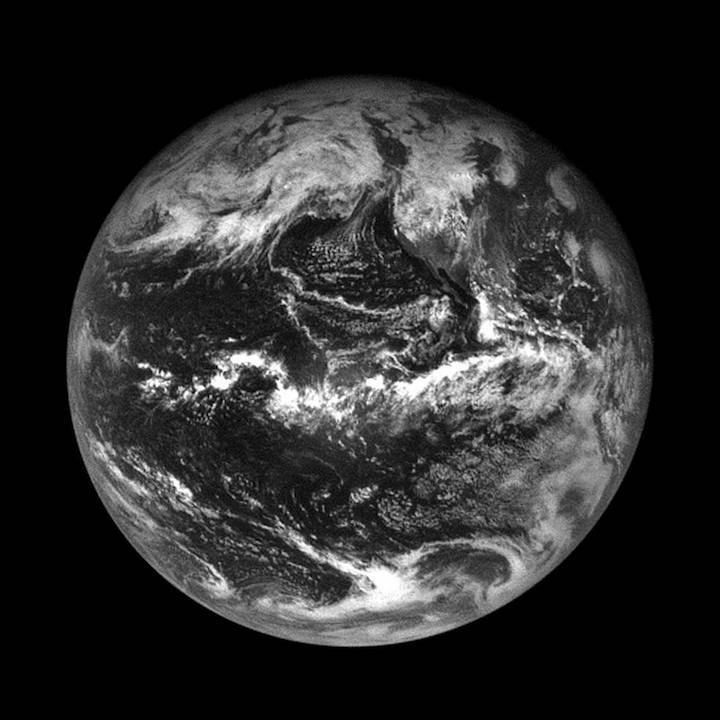 During last week’s flyby, NASA’s OSIRIS-REx spacecraft captured a stunning portrait of Earth’s disk, spanning the Pacific from Australia to America’s West Coast. The color composite image, created from readings that were captured on Friday while the asteroid probe zoomed past at an altitude of 106,000 miles, was released by NASA and the University of Arizona today. You can make out Australia at lower left, and the southwestern U.S. at upper right. The photo op arose because OSIRIS-REx’s mission navigators took advantage of Earth’s gravitational field to slingshot the 20-foot-wide probe toward the asteroid Bennu, which it’s due to reach in late 2018. The science team, in turn, took advantage of the flyby to practice using the craft’s suite of scientific instruments, including the MapCam camera. It looks as if darkness is dripping down from the very top of the image, but those streaks are just data dropouts that occur when MapCam takes pictures with exposure times of less than 3 milliseconds. Earth shone so brightly during the flyby that the camera had to cut its clicks short, but that’s not expected to pose a problem when OSIRIS-REx makes its rendezvous with the much darker asteroid. OSIRIS-REx is an $800 million mission that will study Bennu for several years and grab a sample from its surface (also known as regolith) for return to Earth in 2023. Imagery and other data about the asteroid could help scientists gain a better understanding about the origins of the solar system, the sorts of resources that near-Earth asteroids could offer, and strategies for diverting a potentially threatening asteroid.